I’ve had my hands full trying to put my cottage in order, now that I’m feeling better from the ordeal of moving, not sleeping, and being as freaked out as anybody can be. There was one other thing I worked on this week. Here’s a hint. That said, I didn’t have a post for this weekend. However, I did want to stop and wish you a happy weekend, from me, Lulu and all the crew of the #dieselpunk train! You’re the bee’s knees! Update! I forgot to link to Rob’s blog — it’s here. A Ghost in the Kitchen! Stay tuned, shieks and shebas! You’ve arrived at the end of the line, Shieks and Shebas! This is the final episode for the Jazz Age Wednesdays serial Hullaba Lulu. Well it’s all right, that we’ve been riding around in the breeze. Maybe somewhere down the road aways, you’ll think of me, wonder where I am these days. Well it’s all right, we’re going to the end of the line. This is the dieselpunk series, set in the Roaring Twenties authored by yours truly, and illustrated by Rob Goldstein… and we’re at the end of the line! You can do catch-up reading for most of the past chapters at this post: Real World Tech Review which has links through episode 11.1. Warning — this is a long chapter, but I didn’t think it suitable to divide it into more than one episode. Save your place and take a break if necessary. However, I think it will be a quick read, despite the length. Enough said. Time to get a wriggle on! The angel-bots stood on one another’s shoulders making a automaton tower to try and take Valentino away from Iset, but with disastrous results. They all fell and… Oh the bot-manity! However, “Papa” Nikola Tesla was repairing them. Meanwhile, Valentino was near death. With her multicolored wings, Iset carried him away. Lulu, Gramps, Dynamite, and Ginger took Tesla’s electric car and followed Iset to the Great Pyramid. Inside they found a secret chamber and a large alabaster disk. When they steped on the disk it sailed upward! The rapidly ascending alabaster disk came to a smooth stop. Gramps, Ginger, Dynamite, and I stepped into a chamber that seemed empty except for a veritable forest of metal columns. There were so many that it made the vast room seem like a labyrinth. A tiny spark caught my eye. I realized that each column was topped with intricately formed wires. 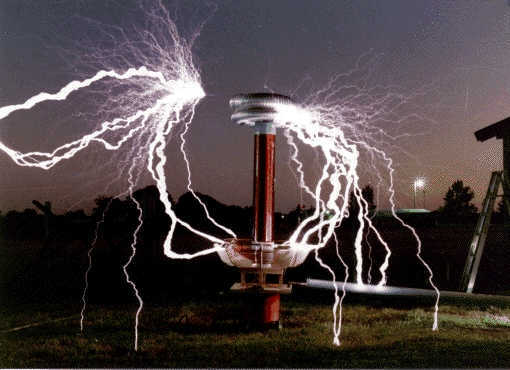 Tesla coils. The room was full of Tesla coils! I stopped in my tracks. I would never get over the fireworks that resulted when I bumped into the one on Valentino’s train. Outside my line of sight, I heard a woman throwing a tantrum. Crashing sounds overlaid ranted words that I couldn’t understand. Gramps hurried toward the voice. I reached for his arm to hold him back, but I wasn’t fast enough. I followed my grandfather in-between the columns and around a corner. The voice belonged to Iset. It was probably the least important thing in the world, but I noticed that Iset’s multicolored wings were gone. I supposed that she only had them when she wanted to fly. After all, huge wings would get in the way when you weren’t using them. Her back was to us. Iset bent over a large, open sarcophagus. She started to chant fervently. Her voice was raw, as if she had been speaking for a long time without a break. “It’s not enough! Nothing I do is ever enough!” Iset sobbed and banged her fists against the sarcophagus. I hissed at Gramps to be still, but he went to Iset. To my astonishment, Iset fell against my grandfather’s shoulder, crying her eyes out. I borrowed Gramps and Iset to show them together. When I moved forward I gasped in horror. Laying in the elaborate casket was Valentino! An intricately carved copper bangle was on Iset’s wrist. I saw that a copper strap ran from the bracelet to a matching cuff on Valentino’s wrist. Another copper bangle-set rested beside him. All the bracelets were carved with hieroglyphics that were inlaid with gemstones. It looked like the gems had been melted into the ancient symbols. “Maybe it needs all three of you,” Gramps told her in a gentle voice. Iset looked up at Gramps with surprised eyes. She turned her head to glare contemptuously at me. “There are enough of those copper cuffs for three siblings,” Gramps continued in a matter of fact tone. My grandfather reached into the casket and put the second bracelet set on Valentino’s bare wrist. Gramps held out the bangle at the other end of the copper strap toward me. “Gramps, what are you talking about?” I demanded, utterly befuddled. I stepped backward. It felt like the rug had been pulled right out from under me. My knees gave way and my fanny bumped one of the metal columns. Ginger caught me before I hit the marble floor. Dynamite grabbed and righted the Tesla coil post an instant before it would have fallen against the next one. I shuddered thinking of the catastrophic domino effect that almost happened. “But… but,” I tried to interject. “We three share the same father,” Iset said in an impatient tone. “How? Gramps, how could you not tell me? Valentino? What if he and I had… I mean,” I stuttered to a stop. “This is not the time for that,” Iset stated bluntly. She took a step toward me, snatched the other bangle from Gramps, and slapped it onto my wrist. “Take his hand to make the connection stronger,” Iset ordered as she grasped Valentino’s hand. The bangle slid down my wrist as I took Valentino’s other hand. His hand was very cold. Iset began chanting again. Her voice was hypnotic, like a song that pulled me into a story. I didn’t understand the language she spoke, yet I found I was able to say the words. It was as if part of me knew the language even though my conscious mind didn’t recognize it. I chanted along with Iset. The gemstone hieroglyphics in the bracelets started to glow. The copper against my wrist felt pleasantly warm. Valentino’s hand was still cold. Iset sobbed and shook her head. “That’s right, Miss. The automatons are also aspects of the train. Although to a lesser degree. However, all of us together represent a complete circuit,” Dynamite explained. A rapid series of clicks and shifting gears came from the rose-gold automaton. Abruptly Ginger blinked and then ran to a window. The angle-bot started climbing out the window. I called for her to come back. We were nearly 500 feet off the ground! “Ginger, be careful,” Dynamite drawled even as he climbed out the window with her. It wasn’t a long distance from the uppermost chamber of the pyramid to its tip, but it was utterly treacherous. The rose-gold automaton found hand and footholds to climb up to the pyramidion. Dynamite was right behind her. I hung halfway out the window watching them. Tiny bits of stone showered down as Dynamite’s foot slipped. Ginger reached one hand down to steady her beau. A pebble hit my cheek and I drew back with an exclamation. However, I couldn’t stop myself form leaning back out again to watch the clockwork duo. As the two reached the zenith, the sun reflected from their gold bodies like a beacon. I put up a hand to shield my eyes. It was blinding. Ginger started to hum. She didn’t hum the way a human would. It was more like the humming sound that comes from a finely tuned motor. The sound she made grew louder. Dynamite started humming at a lower pitch, but it was in harmony with Ginger. Gramps came to the window beside me. He looked up at the angel-bots, puzzled. Then his expression changed. The expression on his face told me he had a hunch. “Something’s missing,” Gramps said, meaning the sounds the angel-bots made. Gramps brought the slide-trombone to his lips. I could tell he was listening intently to the humming. Onstage at his speakeasy, I had seen him figure out songs that he’d never heard before. That’s what he seemed to be doing. My grandfather started playing the trombone. After a few notes he played an intricate flourish that escalated in volume, blending in harmony with the hums of the automatons. All the sounds came to a crescendo. He squinted as he checked his compass. Gramps shielded his sunglasses and stared down at the desert, looking in the direction from which we came. A moment later I heard his sharp intake of breath. I leaned out further to see past him and gasped in astonishment. In the distance I could make out Woo standing on the hood of Tesla’s electric automobile. The diminutive angel-bot leaned forward with arms extended as if she was flying. The car was flanked by dozens of automatons. Their golden bodies glinted in the sun as they ran at full-speed across the desert sands. Clouds of dust churned up by their feet billowed behind their rapidly moving formation. The automatons gathered en masse at the foot of the pyramid. They all began to hum. The harmony was intricate. The vibration of their combined intonations was so strong I could feel it hundreds of feet above. The hair on the back of my neck stood on end. I rushed back to Valentino and reattached the bracelet I wore. The expression on my grandfather’s face told me he had gone to that place inside ― the place from which his music came. Gramps put the slide-trombone to his lips again. I held Valentino’s cold hand tightly. Iset had never let go of his other hand. She looked at me and took my free hand and nodded. “As the automaton said, a complete circuit,” she said, meaning the three of us holding hands. Gramps played a wildly free jazz melody that I had never heard before. I knew that no one had ever played it, at least not on this earth. The uninhibited notes swam and rushed in a torrent. Then the music leveled off to a steady flow. As the music took on a slow, even pulse, the gemstones in the bracelets glowed brighter. I heard Iset gasp. The sound of tiny chimes rang from a device that looked like a large brass compact. It was about the size of a dinner plate. It was Valentino’s video phone. “It’s fine, Lulu. Go ahead and answer it. I gave one to Nikola Tesla. It should be him calling,” Valentino assured me. However, when I opened the big compact, I saw Pearl. In the background I saw palm trees and the luxurious accommodations of the Winter Palace hotel in Luxor. I wondered what Egyptians would think about New York winters. I could hear a man happily cooing beyond Pearl. She looked over her shoulder with an exasperated glare. “I thought Tesla was taking you home,” I told Pearl. “That was the idea,” Pearl began. “Now he’s in the middle of making some kind of business deal and he’s not ready to leave yet. Lulu, I can’t take another minute of this!” Pearl wailed amid all the cooing. “Pearl, what’s going on? I know he’s and odd bird, but I thought he was basically okay. He’s not trying to do something weird to you is he?” I wanted to know. Even though Pearl had been saying hurtful things and showing herself to be a self-important brat, before that we had been friends for a long time. I wouldn’t stand by and let someone mistreat her, even if I didn’t want to have anything else to do with her. “Ha! Odd bird! Lulu, you got that right. It’s the damned pigeons! He’s constantly playing with the blasted birds, feeding them, making silly noises to them. Nerts! He’s more interested in the pigeons than me!” Pearl said frantically. I didn’t know what to say. While I searched for words she continued. “He said he’d send me home any time I wanted. He said he’d pay your way too,” Pearl said in a different tone. “I don’t want to go home,” I told her, puzzled that she would even suggest such a thing. Pearl was in a lather. She pulled off her turban exposing fluffy platinum blond hair. Long dangle earrings tumbled down to graze her shoulders. The cooing noises stopped. Tesla stepped into view behind Pearl. She whirled around to face him and her long earrings swung out nearly touching him. Tesla screamed and ran from the room. Night fell. Stars glittered the deep cobalt sky. A full moon illuminated the Great Pyramid. The train was repaired and it waited beside the ancient structure. I had stopped wondering how they managed to get it there without railroad tracks. Some things were beyond my grasp. The angel-bots had transformed the uppermost chamber of the pyramid to a beautifully appointed dining room. Crystal glasses and champagne bubbles shimmered in candlelight as we celebrated Valentino’s return to health. With her half-brother healed, Iset had become… not exactly nice, but less frightening anyway. I kind of admired her fierceness. I looked from her to Valentino and shook my head wonderingly. I had lost my best friends. Rose left us to stay with a better version of Tom Driberg in that alternative “upside down” Egypt. It felt like I lost Pearl too, but it was because she was never the person she pretended to be. I had been alone most of my life, and I was alone again. Yet while I lost my friends, I had found family — a brother and a sister. So what if we were only half-siblings. I wanted to know about our mutual father, but they weren’t ready to discuss that yet. “And you’re sure we aren’t related,” I heard Gramps say. Gramps and the watch he looks at daily to read the inscription from his late wife. He took out the pocket watch my late grandmother had given him. I knew he read the inscription several times a day. However, that time he stroked his thumb across the case without opening it. He tucked the watch back inside his vest and patted the pocket. I choked on my champagne. Dynamite’s metal hand gently patted my back. I told him that I was okay, and asked for a stronger drink. Gramps and Iset were looking into one another’s eyes like a couple of teenagers. They whispered and giggled. Gramps giggled! I had never seen my grandfather act that way. And with a woman so young? I was shocked. “Dynamite, make that a double!” I pleaded. Abruptly I wondered how young Iset actually was ― or was not. Tesla said she was a goddess. For all I knew, she was twice the age of my grandfather. Neither Iset nor Valentino were ordinary humans. What did that make me if I was their half-sister? “Let me show you Luxor from high above,” Iset told Gramps and motioned toward the window. To my astonishment an airship floated beside the window. “He won’t care as long as I have it back by sunrise,” Iset dismissed her brother’s worry with a wave of her hand. Gramps and Iset moved to the window. The angel-bots helped them onto the airship. I stood gaping. “Don’t wait up,” Gramps told us as he stepped aboard the ship. It was well after midnight. Valentino and I were in the control room of the train. He sat in a chair that had wheels. He spun it around, turning his back to do something with the Ouija board that was part of the train’s navigation system. “I have a brother,” I murmured in awe. The tall gold control angel statue tilted her head down and winked at me. Suddenly confronted with endless choices, I couldn’t pick a destination. I had wanted so badly to visit exotic places and we ended up first in a sideways Atlantic City, and then back to New York for a sideways Cotton Club. It would have been swell when we got to Egypt — that was about as faraway and mysterious a place as I could imagine. But when we got there so many bad things happened. I was pos-i-lutely blotto, but I was happy. I started doing the Charleston and pulled my newfound brother up from his “wheeley” chair and into the dance. As I flung out my arm doing the Charleston, I knocked something over. Then my heel broke and I fell against the Ouija board, tilting it. The angel-bot, Moon, rushed into the control room, leaving the door open. Moon had been working on something outside. I could see the night beyond the open exit hatch. I tripped over the automaton’s foot and landed in the wheeley chair. Valentino reached for me and fell into the control angel. The statue’s eyes popped open wide. The trumpet levitated off its table and blared out a note. The train lurched forward. The sudden motion caused my chair to roll out of the room. I screamed as it continued to roll out the exit hatch. With a thud the chair toppled into the sand. It, and I, rolled end over end several times. My head spun as I staggered to my feet, still fighting with the chair. Horsefeathers! It’s so hot! I’ve really gotten myself into trouble this time. I plopped down and leaned against the huge statue, zozzled. I watched the sun peep over the horizon. As I blinked at the sun, looking up I realized the statue had a man’s face. That was confusing, especially in my splificated state, because I was leaning against a gigantic paw. Well, if it had a face, I’d drink with it — paws or not. I took out my garter flask. It barely had a jorum of skee left. Pearl managed to get Tesla to take her back to New York. Gramps left for a well-deserved romantic tryst with Iset. My latest bout of clumsiness caused me to fall out the door and sent Valentino and his train careening off to who knew where. Worse, I was down to my last drop of hooch! I held up the flask and squinted up at the stone face. Was it wearing a Star of David for an earring? I knew I was tipsy, but I hadn’t noticed that earring a moment earlier. “What is the meaning of life?” a deep voice mumbled. I burped and looked around. I didn’t see anybody. Maybe I was more than a little tipsy. “The meaning of life,” I muttered and looked at the flask. The bottle contained some of the 42-proof whiskey that Gramps got for his speakeasy. A rumrunner from Canada brought it. It wasn’t as strong as the usual hooch, but it sure was smooth. I raised the flask toward the statue in a toast. “42-proof! Here’s to you, bub,” I said and then took a swig. The bottle had a few drops left. On impulse, I sprinkled them on the gigantic stone paw. “There ya go,” I told it with a hiccup. A sound like a rock-slide preceded a heavy thud. I didn’t remember the big mound of sand on the other side of the statue’s paw. Neither did I remember seeing its tail. Then the big stone tail swept back to the other side, making another mound of sand. “Huh?” I raised my eyebrows and murmured worriedly. The earth shook, causing me to stumble away from the statue. I backed away and watched in awe as the stone head moved down to lick the paw where I sprinkled the whiskey. “Smooth,” the deep voice rumbled, louder than before. “Yes, Lulu. You answered my riddle,” the Sphinx told me. Hot air blew the fringe on my dress as the statue snorted. The earth shook again, harder. I fell down. A broad hand reached out to me. I took the strong hand, but eyed its owner skeptically. I was still unsteady from the tremor and grabbed his arm to keep from falling again. His enormous bicep was rock-hard. I gazed up and up, because he had to be nearly seven feet tall. I patted his huge bicep. Hard as sto— I only got half the thought finished. I looked up at a very tall, powerfully built man who effortlessly lifted me to my feet. He was wearing one of those cloth bandana-like hats I had seen in the Egyptian paintings. He also wore a caftan, sunglasses, and one Star of David earring. “Hello, Lulu — Giver of Names,” he greeted me. He took off the sunglasses and grinned at me. He had big green, slit-pupiled eyes. A tufted tail twitched out from under his caftan. “Holy Hannah!” I exclaimed despite myself and stepped backward. “I um, I have to find the train,” I apologized, turning to leave. “Valentino’s train is long gone. You know that. You sent it away yourself,” he said amid deep chuckles. I started to speak but then I noticed the Sphinx statue was gone. My mouth moved but nothing came out. He pointed to the longest, reddest, shiniest automobile I had ever seen. It looked like something from the Amazing Stories magazine. “Oh, that’s right. You don’t exactly know how to drive, and this vehicle is as far removed from an automobile as Valentino’s is from an ordinary train,” he told me. “Just call me Sphinx,” he told me and winked one of those slit-pupiled green eyes. “Maybe later I’ll tell you my name. But try not to ask questions. That compels me to ask you riddles, and that could end badly,” he warned but laughed deeply and loudly. Sphinx opened the passenger door of the vehicle. “Don’t touch anything,” he cautioned as he helped me into the automobile. When he walked around to the driver’s door, the floorboard shifted to accommodate the length of his legs. I looked at the automobile’s dashboard. It had as many blinking lights and strange levers as Valentino’s train. Just under the dash I spotted a small Ouija board. The planchette started to vibrate. I reached out and placed a single finger on the teardrop shaped device. The engine roared to life. Wildly moving shapes like the sine-waves Moon showed me when he opened a door to the “upside down Egypt” surrounded the vehicle. It shot forward and upward, faster than anything could possibly move. The brightly colored waves surrounded the vehicle like a tunnel. It looked like it could go on forever. “I told you not to touch anything!” Sphinx cried in shock. His voice echoed into the distance behind us. 42 — Douglas Adams. The Hitchhiker’s Guide to the Galaxy is a comic science fiction series created by Douglas Adams that has become popular among fans of the genre(s) and members of the scientific community. The answer to the ultimate question of life, the universe, and everything is requested from the supercomputer, Deep Thought, specially built for this purpose. It takes Deep Thought 7½ million years to compute and check the answer, which turns out to be 42. Old Winter Palace Hotel Luxor. A historic British colonial-era 5-star luxury resort hotel located in Luxor, Egypt, just south of Luxor Temple, with 86 rooms and 6 suites. Founded in 1905 it is perched on the Nile River amid luxuriant tropical gardens. Thanks again to Rob Goldstein for generously sharing the beautiful illustrations, that brought my words to life for everyone. If you missed it, Rob talks about how making these images was important for him on a personal level in a podcast you can reach via his blog. Thank you — each and every one of you — from the bottom of my heart for being on this train! It’s been a fun, wild ride, and it would never have happened without you. Many of you have been with this train from the introduction all the way through the end of the line. I appreciate you more than you could know. You’re pos-i-lutely the cat’s pajamas. Now some shameless self-promotion for my other 1920s books — the original “three things” stories about Paisley Idelle Peabody, aka Pip, and her friends. Hi there, Shieks and Shebas! You’ve come to the train station for Jazz Age Wednesdays. This is where I share stories set in the Roaring Twenties. The fabulous images for this #DieselPunk story are created by artist, Rob Goldstein. He also makes pos-i-lutely swell videos that are parallel to the story. Plus, Rob sent random “things” that I used as prompts as I envisioned and authored Hullaba Lulu. If you need reminders of past chapters, I did a Real World Tech Review post that has links through episode 11.1. That said, I’m nearing the end of this adventure for Lulu and the crew. So I’m posting a longer chapter today. I’m still pantsering, writing in an unplanned spontaneous way, so I’m not sure whether the end will arrive next week or the next, but we’re almost there. Iset with her multicolored wings flew away with Valentino! The angel-bots stood on one another’s shoulders making a automaton tower to try and take Valentino away from Iset, but with disastrous results. They all fell and… Oh the bot-manity! I think I hear the trumpet’s call. Let’s get a wiggle on. Nikola Tesla bent over the unmoving angel-bot, Moon. I couldn’t see what the inventor did, but he seemed to examine the automaton in much the same way a medical doctor would check a human. Moon, desperate to aid Valentino had tried to charge Tesla’s electric automobile by using his own body to power the vehicle. I thought about Moon’s kindness to me when I had bumped into the Tesla coil in the control room of the train. Although, the real problem was that sabotage had previously been done to the control room, my clumsiness was the cause of the train careening toward the Cotton Club and then into a pittura metafisica. The train had emerged from the painting to land in the sand dunes of Egypt. The saboteur’s actions also caused the gradual degradation of Valentino’s connection to the train, resulting in his mysterious illness. I didn’t understand how it all worked, but Valentino had to be “attuned” to all the control components of the train. If the train wasn’t working perfectly, then neither was he. Anyhow, Moon was a real gent. He didn’t let anyone know I had touched a thing. I heard Tesla sniffle as he worked on Moon. Gramps seemed to feel sorry for the inventor. I think my grandfather was trying to take the man’s mind off Moon and the other angel-bots who were damaged or possibly destroyed. Gramps cleared his throat awkwardly. In contrast to the kind intent of my grandfather, Pearl simply didn’t understand Tesla’s concern for the automatons. The look on Tesla’s face when Woo hit the ground and came apart… the poor man was mortified. With Moon’s collapse, he had another clockwork creature to try and save before he could even reach the one with the worst need. “Satchmo?” I asked Pearl, hoping she would just go back inside. “That wasn’t the woman’s name. It’s the nickname of Louis Armstrong. He’s performed at Gramps’ speakeasy several times. But you weren’t there the times he played. I guess you were worried about being seen with the wrong people,” I added pointedly, unable to forget Pearl’s snooty comment about my family and me. Suddenly, something clicked into place in my mind. “I’ll be glad when you’re dead, you rascal, you. Oh, I’ll be tickled to death when you leave this earth, it’s true,” Gramps sang in a gravely voice. “Yes, Lulu, she was singing a Louis Armstrong song,” he told us. Nickola Tesla let out a guffaw, surprising all of us. He straightened from working on Moon, and wiped a tear from his eye. The inventor stepped back from the damaged automaton. He stopped beside me. His hair had a mildly citrus scent from the pomade that oiled his hair into place. Tesla was almost a vaselino, the men’s hairstyle popularized by silent film stars. I supposed a man with a phobia about human hair liked to keep his own mane well controlled. “I apologize,” the inventor began. “It’s the idea of the goddess Iset having a fondness for American jazz,” he finished, chuckled, and took his handkerchief from his pocket. “A gorgeous, exotic woman who likes Jazz…” Gramps began in a wistful tone. “She’s the most beautiful thing I’ve seen since I was a young man delivering bottles my father and I made. I had a delivery at Ellis Island, where I met your grandmother, Lulu. Priscilla had just arrived in this country. I loved her the minute I saw her,” he added and opened his pocket-watch to look at the inscription from his late wife. “Goddess? I admit she was no cancelled stamp, but ‘goddess’ is excessive, don’t you think?” Pearl interjected, taken aback. Then everyone began to speak at once, wanting an explanation for the inventor’s comment. Tesla reminded us that Valentino said the name “Iset” when the woman bent over him. I wanted to know how Tesla could know who the woman was. “Didn’t you notice her crown?” he asked. “That ridiculous chair-hat?” Pearl burst out in an unladylike way. I thought the fair-haired flapper, whom I had thought of as a friend for so long was close to losing her temper. Tesla paused and looked at her oddly. Pearl had been practically glued to his elbow since she put that turban on her head to cover her hair. Pearl sank back demurely, most unlike her usually exuberant self. She glanced at Tesla covertly. “She had all that long hair. It was just… loose, able to get on anything,” Pearl added in a soft voice. Pearl made a little face as though she found the long hair distasteful. I watched Tesla’s expression. His face remained calm, but his shoulder twitched. I realized he failed to completely suppress a shudder at the idea of all that human hair. Pearl smirked when she saw him twitch. She put her hand to the turban to make sure her blond hair was securely underneath it and moved a little closer. My pal was more devious than I had ever guessed. Pearl gave a knowing nod. With a series of clicks and whirrs, Moon sat up. The angel-bot’s eyes blinked a few times as he looked around at all of us. He bounded to his feet. It looked like Tesla had fixed Moon. However, the angel-bot abruptly stopped in the middle of what he was saying. All sorts of sounds came from his insides, clicking, whining, even a screech of metal. Eyes open wide, Moon managed to nod once. That statement seemed to help Moon. After a moment I heard gears whine again, but it sounded like they reset themselves somehow. The electric automobile was fully charged, thanks to the selfless efforts of Moon. We got into it and hurried to the scene of clockwork carnage. The sands of Egypt were littered with shining gold pieces and parts. If the victims had been human, it would have looked as bad as any of the horrific battle scenes of the Great War. Apparently, it really did seem that terrible to Nikola Tesla. The inventor fell to his knees, covering his mouth with both hands. Moon gently placed a blue-gold hand on his shoulder. Pragmatic as ever, Dynamite along with his blue surge, Hot Ginger already had the scene organized. Angel-bots in pairs worked to carry their damaged fellows to various areas that appeared to be organized according to the type of damage incurred. Pearl’s patience had clearly worn thin with Tesla’s devotion to the automatons. A sneer marred her pretty face. She looked around at the wreckage, and then back toward the train. Pearl scanned the horizon, probably looking for a means of escape. However, the only thing in view was the Great Pyramid. She took a deep breath. Pearl tucked-in platinum blond hair that had escaped her turban during the drive. She straightened her back and smoothed the old-fashioned dress. Then she walked over to Tesla. “It’s not proper work for a lady,” she began and that phrase alone told me that she was calculating again. “But perhaps I can help somehow,” Pearl suggested to Tesla. A small smile told me the way Pearl worded her offer had the desired effect. Tesla patted her hand and told her not to fret, that he would take care of everything. Then as a brilliant finishing touch, Pearl staggered, as if swooning. She placed a pale hand to her brow. For a moment, Tesla’s attention transferred to Pearl. He asked Ginger to look after Pearl. The delicate flower was clearly having a fit of the vapors. Ginger solicitously helped Pearl to a canopy that was erected nearby for shade. It was obvious to me that Ginger could tell nothing was wrong with Pearl. When Dynamite joined them, I could hear a series of clicks and whirrs as the two angel-bots watched Tesla converse with my grandfather. The two automatons hurried off toward the train. Gramps and Tesla spoke softly. A moment later my grandfather got behind the wheel of the electric automobile. I hopped in beside him. Before we could leave, Ginger and Dynamite came toward us at a run. Dynamite held a wooden box. Ginger carried a case that looked sort of like it was for a trumpet, but it was longer. The angel-bots jumped in behind us. I always knew the rose-gold automaton, Ginger had a soft spot for Gramps. I chuckled to myself. Dynamite might have had some competition if my grandfather was more like Tesla. I had a moment of déjà vu when Ginger leaned forward and pressed a button under the dash. The electric automobile lurched forward. The vehicle moved faster than any jalopy I had ever seen. My hat flew off, but Dynamite reached up and caught it. Clouds of dust and sand billowed in our wake. The Great Pyramid of Gisa loomed ahead. A thick layer of dust softened the sound of our footfalls. The atmosphere felt close inside the Great Pyramid. I had to keep reminding myself to breathe, because I was so worried and afraid that I could barely draw air into my lungs. The angel-bots Dynamite and Ginger found the way inside the ancient, gigantic structure without difficulty. Gramps and I followed their lead. They had an unexpected amount of knowledge about the place. “You’ve been here before, haven’t you?” I asked the clockwork creatures. They both paused, turned to look at me, and blinked. Dynamite shifted the wooden box he carried. Ginger still held the odd leather case that looked like it was made for a musical instrument. They looked at each other while an inordinate number of clicks and whirrs passed between them. After a moment, I got the most unexpected answer. We entered a broad chamber with columns and tall Egyptian statues. The center of the area was sunken. We walked down three broad steps. In the focal point was an elevated stone bench or bed. Gramps moved to inspect it. “I don’t see any blood,” my grandfather commented. Gramps shrugged. Abruptly I noticed his foot prints in the dust. I cast the light of my torch around the floor. I didn’t see any prints but our own. “We’re the only ones who have been here in a very long time,” I murmured. “Are you sure they came here?” I asked Dynamite and both angel-bots nodded. Ginger walked to a broad pillar. Only then did I notice the bronze statue of a woman with wings and the chair-like hat that I had learned was a crown. I gasped. It looked just like Iset! I lifted my skirt and took out a flask. Pearl wasn’t the only flapper with a garter flask. I took a swig and then sat it down on one of the steps. The rose-gold automaton shifted her position a few times. Dynamite joined her and made the same movements. Gramps removed something from his pocked. At first, I thought it was his pocket-watch, but I saw that it was a compass. He went to stand beside the angel-bots. Ginger placed her free hand on my grandfather’s arm and they walked across the chamber. When she stopped, Ginger opened the leather case. “None of the attendants can play wind instruments,” Ginger told Gramps as she removed a slide trombone from the case. “The correct notes must be played on the proper type of instrument to open the hidden door. However, I don’t know what combination of notes will open it,” she added pointing to the wall. Together Ginger and Dynamite made a sustained musical tone. Gramps immediately nailed the note, humming with them for a moment. One of his bushy eyebrows arched upward. He stopped humming and made a harrumph sound. The angel-bots swayed along with the music. The sound of the horn echoed throughout the pyramid. My skin twitched. Something wasn’t right. I noticed my flask. The hooch inside the glass container swished. The chamber was trembling. Sand peppered down from the ceiling. I put the cap on the giggle water. The vibration became stronger. It was accompanied by a low scraping sound. Large stones of the wall shifted back and then to the side. Gramps had played the right notes to open a secret door. I hissed for him not to do it, but Gramps stepped into the dark room. I ran to catch up with him, and the angel-bots followed. My torch started to flicker. In the center of the room was a dais of alabaster tile and surrounded by a stone railing. Gramps stepped onto the dais. The angel-bots and I followed. Lights beneath the translucent tiles came on, providing soft illumination. With a jolt the dais started to move upward. I staggered and grabbed the stone rail. As the alabaster disk rapidly ascended, I heard the scrape of stones as the secret door closed. I think Tesla and Moon can probably repair the injured angle-bots. Although, Woo was in pieces when she hit the ground… Now Lulu, Gramps, Dyanmite, and Ginger are in the Great Pyramid. Where is that rapidly ascending alabaster disk taking them? Will Valentino be there? What about Iset? We still don’t know what to expect from her. Be at the station again next week as we climb toward a conclusion. In “Mud and Sand,” Stan Laurel played matador Rhubarb Vaselino in a parody of “Blood and Sand,” which starred Rudolph Valentino. I hope you will be at the station again next week to catch the diesel-punk train. Thanks for visiting. You’re the cat’s pajamas! Iset. Art by Rob Goldstein. Welcome to Jazz Age Wednesdays. This is where I share stories set in the Roaring Twenties, be they cozy mysteries (like Pip’s stories) or dieselpunk, like Hullaba Lulu. San Francisco artist, Rob Goldstein created the pos-i-lutely swell images for this episode. If you need a comprehensive review of this serial, I did that with a Real World Tech Review episode. Frighteningly, Iset leaned over Valentino and told him “I’ll be glad when you’re dead, you rascal, you. Oh, I’ll be tickled to death when you leave this earth, it’s true.” Just as scary, she winked at Gramps when he recognized the song from which those hateful-sounding words came. Then, Iset with her multicolored wings flew away with Valentino! I think I hear the trumpet’s call. Let’s get a wiggle on with Chapter 12.1. The blue sky seemed to shimmer around them. I watched helplessly as the beautiful woman Valentino had called Iset soared away on multicolored wings. Valentino dangled in her grasp. Valentino’s angel-bots poured out of the train, following on the ground. They ran faster than I would have imagined possible. It looked like they were trying to get a head of the flying woman. Having achieved a small lead, they abruptly began to climb onto one another’s shoulders. They formed a triangular shape of clockwork bodies that towered skyward. A trio of angel bots ran for momentum and began vaulting up toward the top of the formation. One was noticeably smaller than the other two. It had to be Wicky, Wacky, and the more diminutive Woo. He lifted his hand to shield his eyes from the intense sunlight, dislodging Pearl’s hold on his arm. “But they are machines,” Pearl complained. Tesla looked at her as if she had said something incomprehensible. Woo climbed and jumped along with Wicky and Wacky, all three received helping hands from the automatons in the formation. Finally, they were at the top of the triangle. I gasped in astonishment when Wicky and Wacky each took one of Woo’s arms and threw her high into the sky! As Woo was propelled heavenward, Iset passed over with Valentino. Woo grabbed for the enigmatic man’s ankle. However, she lost her hold and fell back. Iset lost her grasp on Valentino. Still unconscious he fell through the air along with Woo. Woo tried again to catch hold of him as they fell, but Valentino was just out of her reach. Wicky and Wacky leaned out dangerously far in attempt to catch the falling Woo. At first, she reached toward them. Then the entire formation of angle-bots became unstable and started to wobble. The tower of automatons swayed far to the left and then dangerously to the right. It made me think of a terrifying tango as they leaned forward as if in a dip and then swayed some more. Woo drew back her hand, apparently realizing that if the others caught her the entire group would fall disastrously. Wicky and Wacky straightened. The towering triangle of automatons gradually settled as each clockwork creature regained balance. Meanwhile, Valentino’s unconscious form plummeted earthward. Iset swooped down and caught him, barely a second before he would have hit the ground. A few flaps of her majestic multicolored wings took them back high into the sky again. With so much happening, I repeatedly looked from one impending tragedy to the other. I saw Woo’s metal form hit the desert sands. Her body bounced more than once. I saw pieces of her come loose. Cringing and unable to bear that terrible scene, I looked back to Iset and Valentino. They had already flown beyond my sight. Nickola Tesla screamed in horror when he witnessed Woo’s fall. “Quickly, quickly! There will be much to be repaired,” Tesla cried and ran toward his automobile. The wind whipped up fiercely. Gramps and I hurried after the inventor. Of course, Pearl was right on Tesla’s heels. Her turban almost came off as she ran. Pearl paused to make sure her hair was hidden. I saw the bluish gold angel-bot near Tesla’s electric automobile. Moon always looked after the most advanced of the amazing whatchamacallits on the train. He seldom left the train so it was not unexpected that he stayed behind when the other attendants left. However, I was surprised to see a thick cable that ran from the automobile to Moon’s stomach. “Moon!” Nikola Tesla called to the angel-bot. “What have you done?” he asked in dismay. Sparks came from Moon’s eyes. The usual clicks and whirrs were broken by electric pops. The automaton turned to Tesla in an unsteady motion. Abruptly Moon collapsed in a heap of blue-gold metal. Things are even worse! How is that possible? How many angel-bots were hurt when their towering triangle formation collapsed. Woo was in pieces when she hit the ground. Can she be saved? Plus, with the wind assisting her flight, how can they catch up with Iset? And what does she have in mine anyway? Be at the station again next week. Maybe we’ll get some answers then. Nikola Tesla’s Electric Car. There are a number of conflicting stories as to whether Tesla truly invented a working, rechargeable electric car. However, there are also numerous accounts of his inventions and discoveries being suppressed by corporations and other entities who did so to advance their own financial interests. I’ll leave it to you to decide. In Hullaba Lulu, Nikola Tesla has his own fictional electric automobile. The Tango. Above, not your everyday tango! In the 1920s, the tango moved out of the lower-class brothels and became a more respectable form of music and dance. Thanks for visiting. You’re the caterpillar’s kimono! Welcome everyone. The diesel-punk train has arrived at Jazz Age Wednesdays. It’s great to see all you Sheiks and Shebas! The diesel-punk train has been stuck in that Egyptian sand dune where it exited the pittura metafisica — both in the story and in my head. Sunday is my writing day, so as I pen this, I was looking for inspiration. I landed on the video composite (below) of Louis Armstrong. It includes some 1920s footage. At the video site, there’s a nice bit of history too. The second song “I’ll Be Glad When You’re Dead, You Rascal,” got me going with this episode. Does that seem like odd inspiration? Read on and you’ll understand. All the angel-bots were excited to see Papá, who turned out to be Nikola Tesla. The inventor brought his violet ray machine and tried, unsuccessfully to heal Valentino. Lulu felt an odd fluttering sensation inside her head. A strange but beautiful woman blinked into her sight but disappeared. Later, Lulu barely overcame the urge to shave Pearl’s head for her superiority complex and the snobbish things she said about Lulu and her family. What do you think I did with the “things” that spontaneously drove this chapter? Without further ado, let’s get a wiggle on with Chapter 11.3. Do you hear Valentino’s trumpet? Everything seemed to sparkle. Lights reflected in the chrome-and-glass coin-operated machines of the automat. I stared absently at the beautifully ornate mirrors, marble, and marquetry, as my half-eaten fried chicken got cold. A sign identifying Horn & Hardart* was positioned vertically so that the words lay on their sides. It was true. From revelations about my absent mother to all the strangeness of the oddly different versions of Atlantic City and the Cotton Club. I felt like my entire life was catawampus, sideways. One of the clockwork attendants was clearing plates from a nearby table. Placing the dishes on a cart it pushed some buttons and the cart rolled smoothly away to the kitchen. Remote control, I’d never get used to it. “Pardon, Miss?” Woo asked in a voice subtly accented with Chinese. I didn’t know it was her until she spoke. Though a few of the clockwork attendants had distinguishing features, most of the were identical. Only their unique voices set them apart. Lulu waits for news about Valentino’s condition. Woo brings refreshments. Reaching to a different cart, Woo placed a bloody mary and a small bowl of horseradish on my table. She asked if anything was wrong with my chicken. I told her that it was fine and thanked her for remembering the horseradish that I had not requested. The clockwork attendant shifted in a foot-to-foot hesitation. I had come to realize that movement meant they were uncertain about something, or perhaps looking for the correct words. “Thank you for your insights about the gowns,” Woo finally finished. “Oh, you mean for Pearl? It was nothing. I’m sorry she was being such a rubber to you,” I told her. The automaton lives up to the name angel-bot, I thought. Woo had the patience of a saint to deal with Pearl. She looked at me curiously when I shook my head and stuck my fingers in my ears. That weird fluttering sensation deep inside my ears ― I’d felt it once before. It was back. Fluttering like a bird trapped inside my head, trying to escape. My head started to buzz. That also happened the other time. Lights blared like a camera flash, although I realized the lamps in the automat hadn’t so much as blinked. From one of the strobes of light, the strangely beautiful woman in a long white gown appeared for the second time. Her long onyx hair lifted on a current that might have been from air or from electricity. She still wore that funny little hat. It looked like a tiny chair on top of her head. The woman leaned down and sniffed of me! I drew away. She sneered but it turned into a vulpine grin. Although that didn’t seem any friendlier. With another flash of light, she vanished. I shook my head again. Repeated clicking caused me to turn toward Woo. Her eyes blinked convulsively. “I have to go―” I started. “Miss, we should―” Woo began. “Check on Valentino,” I added in chorus with the angel-bot. At the suggestion of Moon, the engineering attendant, I had played music on the theremin several times. Moon had hoped it would repair Valentino’s connection with the train. That was a side effect of when the train’s Tesla coil was sabotaged. However, any positive effect the eerie music had on the enigmatic man didn’t last long. We had high hopes that Nikola Tesla could cure Valentino using his violet ray machine. However, despite the inventor’s efforts the benefits of the machine did not appear to be what Valentino needed. Tesla was in the middle of another session when Woo and I walked into the room. Valentino moaned fretfully as Nikola Tesla used the odd-looking contraption he called a violet ray. His speech was slurred as if he was zozzled, although I knew it was from his sickness. It sounded like he asked if something was set. He repeated the word “is.” Then he started saying my name along with his ravings. “Is what set?” I asked him, but my lack of understanding only seemed to upset him more. As Tesla worked, the room was suffused in violet light. The air became charged with static electricity. A sizzling noise met my ears. When I commented on a pleasant smell that seemed to be one of the effects, Tesla told me that it was the odor of ozone. He said we should go ahead and inhale the ozone, that it was good for us. Then he took a deep breath as if to illustrate. Only then did I notice Pearl sitting behind Tesla. She wore a modest pastel gown in an outdated style. A matching turban hid her fair hair. Her long earrings were notably missing. She looked like the women of the past, whom Tesla was quoted as saying he preferred. She had also hidden the things of which he had phobias ― human hair and women’s earrings. Pearl moved the stool on which she sat, staying as close to the inventor as she could get without causing him to trip over her. To my surprise, Tesla gave Pearl a fond glance. Her plan to win Nikola Tesla seemed to be working. I saw my grandfather’s intense gaze. The man could stare down a locomotive if he put his mind to it. At first, I thought he looked at me, but his eyes were fixed on a spot just over my shoulder. “Now all she needs is some pigeons,” a voice said from behind me. Startled, I turned around to see the onyx-haired woman from before. She pushed past me, moving toward Valentino. “Satchmo?” Gramps muttered incredulously, causing to the woman to divert her intense gaze from Valentino to him. She gave my grandfather that vulpine smile and winked! His eyes bulged. “But I can’t let you die just yet,” the woman added, turning back to Valentino. I heard the fluttering again, but that time it was not inside my head. Abruptly the woman had wings! I remembered the huge multicolored wing I had glimpsed a few times. I wondered if it was her. I couldn’t tell because everything in the room had a purplish cast from the violet ray machine. Abruptly Valentino sat up on the table where he lay. He shouted a single word. In an instant the winged woman stepped toward Valentino. Her large wings obscured my view. “Is… Ist…,” Valentino raved. “Iset,” he finally spoke clearly. Then I was blinded by intense repeated flashes of light. When the spots cleared from my vision, the woman and Valentino were both gone. The angel-bots rushed to a window and pulled back the curtains. I could see the black-haired woman spread multicolored wings. She flew away, carrying Valentino with her. Is-who? Iset? That might be good… Then again she didn’t exactly seem friendly, so it could be really bad! And now the strange winged woman has noticed Gramps. I’m with Lulu — that would scare me too! Satchmo. Louis Armstrong (via OneMediaMusic) Louis Armstrong, nicknamed Satchmo or Pops, was an American jazz trumpeter and singer from New Orleans, Louisiana. Coming to prominence in the 1920s as an “inventive” cornet and trumpet player, Armstrong was a foundational influence in jazz, shifting the focus of the music from collective improvisation to solo performance. With his instantly recognizable deep and distinctive gravelly voice, Armstrong was also an influential singer, demonstrating great dexterity as an improviser, bending the lyrics and melody of a song for expressive purposes. Horn & Hardart and its cavernous, waiterless establishments represented a combination of fast-food, vending and cafeteria-style eateries. These restaurants, with their chrome-and-glass coin-operated machines, brought high-tech, inexpensive eating to a low-tech era. became an American icon, celebrated in song and humor. With their uniform recipes and centralized commissary system of supplying their restaurants, the automats were America’s first major fast-food chain. Thanks for visiting. You’re the oyster’s earrings! Yes, it’s Jazz Age Wednesday. This is where you would find the dieselpunk serial, Hullaba Lulu. It’s written by me and illustrated by artist, Rob Goldstein. The weekend is my writing time, but this past weekend, life got in the way. That can even happen with a simple life like mine. So Valentino’s train won’t be at the station today. Saturday I did a big post that touched on the “20s tech” that has been used in Hullaba Lulu so far. It also included links to all of the past chapters! That makes today a good time to refresh your memory or catch a chapter you may have missed. Click over if you need to catch up. Recently Rob did a video of the parallel Lulu-verse that he sometimes creates. It’s fun, whether or not it happens in this story. If you’re particularly sensitive to spoilers, or if things like this confuse you, save it for later. Still — no guarantees that this will or won’t happen in the story, but check out Rob’s video here. His work is always spectacular. I promise that next Wednesday I’ll pick up where we left off with last week’s episode. There’s more spontaneously written fun with Lulu and company on the way. They still have to deal with Sarcophagus and Remote Control. I hope you will be at the station again next week to catch the dieselpunk train. Hello, everyone! Welcome to my sanctuary. Or maybe I should say welcome Shieks and Shebas, because this post sort of reviews my Jazz Age Wednesdays serial, Hullaba Lulu. My “partner in crime” for the #DieselPunk serial is artist Rob Goldstein who creates the illustrations and videos for Hullaba Lulu. Between us we’ve added many real world elements from Roaring Twenties culture and technology. Today I’m spotlighting the real (though I used some of it in a fantastical way) technology and popular culture items of the Roaring Twenties. Some of these were “things” sent by Rob, others came along as part of my storytelling. This post will also serve as a catch-up review of Hullaba Lulu. It’s no surprise that music was a big part of the Jazz Age. I created the some of the characters for Hullaba Lulu, inspired by the song Rob told me his grandmother sang to him. What 1920s story could leave out things to do with Prohibition? I added a contradiction to a character by giving the flask to “darned nice girl” Pearl. Volumes could be written about that extraordinary collection of people, the Bright Young Things. That “thing” inspired me to include a fictionalized Tom Driberg in the story. As they were during the Victorian Era, people in the 1920s continued to be fascinated with spiritualism. Seances, tarot readings, and Ouija boards were popular. When Rob sent the Ouija as a “thing” my imagination went off the rails and I made it part of the control system of Valentino’s train. That was just the beginning of me adding outrageous elements to the train. Jung was a prominent figure of the 1920s. His work has been influential in not only psychiatry but also anthropology, archaeology, literature, philosophy, and religious studies. When Rob mentioned the “red notebook” it took a bit of thinking for me to work it into the story. In 1925 the Orthophonic Victrola was a big innovation in sound reproduction. That real 20s tech thing was another real world item I couldn’t resist adding to the diesel-punk tech of the fantastical train. Part two of Chapter 5 gave us more “20s Tech.” Yes, they really had automats and vending machines even before the 1920s! The automats were gigantic, coin-operated vending machines with row upon row of windowed compartments, resembling glass-fronted post office boxes, housing dozens of menu items. I gave the train the automat of my dreams. It even makes cash. Amusement parks came along in the Victorian Era. Flappers loved them too. Herbert W. Sellner, a woodworker and maker of water slides, invented the Tilt-A-Whirl in 1926 at his Faribault, Minnesota, home. In 1927, the first 14 Tilt-A-Whirls were built in Herbert’s basement and yard. Watch out for the tilt-a-whirl in the story… it’s not normal. The Japanese port city of Nagasaki became something of a fantasy in Jazz Age songs, with lyrics only vaguely related to the real city. Several US novelty songs were set in “exotic” locations popular in the era. “Back in Nagasaki” inspired Rob to create a video. It gave me the idea for a group of automaton characters, Dynamite, his crush Hot Ginger, and later, Wicky, Wacky, and Woo. That song also led to Lulu receiving a title from the angel-bots — Giver of Names. The Kodak company had been making cameras for quite awhile in the 20s. The Brownie was popular. In the story, I had Lulu borrow the one belonging to Gramps. You saw him with it in the title image. Improvements in women’s rights, and changes in fashion brought about the “tomboy look,” (favored by author Margaret Mitchell) and the more sophisticated Garçonne Look. For either, women wore menswear inspired clothes, including trousers, or simply men’s clothes. Rob dressed the Lauren character in the Garçonne Look. That ride came along before the 20s but it made a great “thing” for the story, not to mention a couple of cliffhangers. The original, sometimes also referred to as the Chicago Wheel, was designed and constructed by George Washington Gale Ferris Jr.. With a height of 80.4 metres (264 ft) it was the tallest attraction at the World’s Columbian Exposition in Chicago, Illinois, where it opened to the public on June 21, 1893. Lulu is a little… well, let’s be honest. That flapper can be a bit crass. She gets food on her clothes and face, and she burps and hiccups… Bubblegum is her least offensive habit. In 1928, an accountant invented bubblegum. Walter Diemer, was experimenting with new gum recipes. One recipe was less sticky than regular chewing gum, and stretched more easily. The original bubble gum was pink in color because that was the dye that Diemer had most on hand at the time. Pittura Metafisica: Marked by a strong sense of solitude and melancholy, the uncanny and dreamlike urban spaces and enigmatic iconography were typical of Pittura Metafisica or “Metaphysical Painting.” Valentino is clearly no ordinary man. When he creates that kind of painting, you might accidentally walk right into it. Can you believe they actually had videophones in the 20s? That was one of the most surprising “things” Rob sent. They were first invented all the way back in the late 1800s, but they were refined in the 20s. For more click here. I try to use all the senses in my stories. This iconic perfume was around back then. Chanel No. 5: In 1921, a very clever designer and businesswoman created a scent that revolutionized the way women smell. About a 100 years later, people still know Chanel No. 5. I let this “thing” belong to Rose. Tom Driberg uses expensive gifts to try and lure her back. The jukebox in the story seems to have a mind of its own. That resulted in another character name being inspired by a song, Cuban Moon. Ah yes… more tech! I decided to put one in Valentino’s Rolls-Royce. The first electric starter was installed on an Arnold, an adaptation of the Benz Velo, built in 1896 in East Peckham, England, by electrical engineer H. J. Dowsing. In 1903, Clyde J. Coleman invented and patented the first electric starter in America U.S. Patent 0,745,157. I allowed the automatons a moment of heroism with a rather fantastic electromagnet. The real one was invented in 1825. William Sturgeon’s first one was a horseshoe-shaped piece of iron wrapped with a loosely wound coil. When a current was passed through the coil the electromagnet became magnetized, and when the current was stopped, the coil was demagnetized. It could lift nine pounds with a seven-ounce piece of iron wrapped with wires through which the current of a single cell battery was sent. The one I fictionalized lifted a lot more. Music again, but not the ordinary variety! Rob sent this great “thing” and now I want one. It would freak out my cat, so I’ll resist. It’s a real world thing, but I used it in a fictional way, letting its freaky music be “medicinal” to help a sick character. Originally known as the ætherphone/etherphone or thereminophone, a theremin is an electronic musical instrument controlled without physical contact by the performer. It is named after the Westernized name of its Soviet inventor, Léon Theremin, who patented the device in 1928. Egyptomania took hold long before the Jazz Age, but it was still “alive” and well. I brought this in when I let a certain character come back when he was spotted at an archaeological dig. When short, bobbed, hair became popular in the 20s it was no short lived thing. Along with a lot of technical innovations I think of the huge changes in women’s fashion as a time of innovation as well. Fashions of the Jazz Age focused on movement. Short hair brought on long earrings, dangling with that desired movement. Earrings also tied to a real world element with a real life phobia for Nikola Tesla. Jewelry styles of the 1920s are still popular today. Deborah at Circadian Reflections asked for a picture of the earrings I recently bought. So, here are my fun, long, yellow tassel earrings, reminiscent of the Roaring Twenties. The Violet Ray is probably the most startling “thing” Rob has sent yet. I can’t take credit for it, wild as my imagination can be. Nope… it’s real. Invented by Nikola Tesla, the violet ray is a user-friendly, hand-held device that can be used with a variety of glass applicators, such as a bulb, a comb-rake, or a rod, each with a specific purpose. The glass is inserted into the tip of the hand-held section. After being plugged in and turned on, the appliance becomes a high-voltage, low amperage (current) source of static electricity. Its discharge creates a violet color (hence, its name), a pleasant ozone smell – and a sizzling noise. Hopefully I will be able to add even more real world 1920s tech and culture as this story eventually comes to a close. I hope you’ve enjoyed this tech review. If you haven’t gotten on the train, you can catch up by clicking the Hullaba Lulu category on the right side of the page. You’ll meet Lulu, her Gramps, friends Rose and Pearl, and some other characters as they begin a journey with an enigmatic man who only calls himself Valentino. Listen for the trumpet’s call and the conductor’s announcement, All aboard! That’s here each week for Jazz Age Wednesdays. Thanks for taking time to visit. I love your comments, so be sure to say hello. You’re the cat’s pajamas!